As the cold weather FINALLY hits us here in Scottsdale, I'm searching the cupboard for healthy comfort foods. I love warm soups in cold weather, so this is a perfect weeknight dinner recipe for the season. 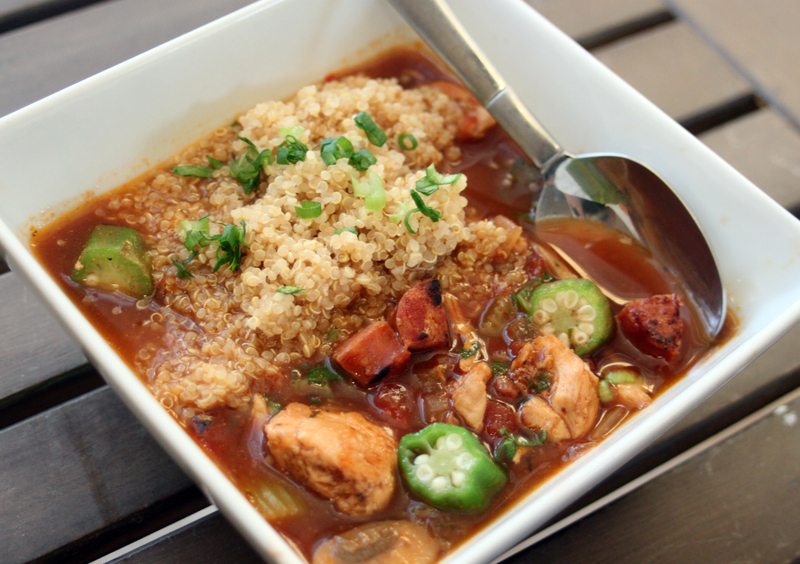 I used quinoa instead of rice to add some healthy protein and just a little more texture. Of course, if you're partial to rice in this, you can substitute it out. Also, be sure to look at your chicken sausage labels. Some brands out there have more fat and calories than the pork brands! Spray a large pot with cooking spray and heat on medium heat. Add the chicken, sausages and mushrooms. Season with salt and pepper and brown on medium heat for about 5 minutes. Add the celery, garlic,onions and green pepper. Continue to cook on medium heat for an additional 5 minutes, until the liquid begins to cook out of the veggies. Pour in the stewed tomatoes and chicken broth. Season with salt and pepper, creole seasoning, jerk seasoning and Worcestershire sauce. Bring to a boil, stirring frequently, reduce to a simmer and cook for about 30 minutes. Add frozen okra, chopped scallions and simmer for an additional 5 minutes. To serve: Pour servings into a bowl and add cooked quinoa on top, garnish with flat leaf parsley and serve.